Regiment/Catrawd: 11th Battalion, Essex Regiment. Service Rank and Number / Rheng gwasanaeth a rhif: Private No. 43801. Military Cemetery/Memorial / Fynwent milwrol: Nine Elms British Cemetery, West-Vlaanderen. Ref No Grave or Memorial / Rhif cyfeirnod bedd: Plot: X1.Row: E. Grave:19. Killed in action on Sunday 30 June 1918, aged 23 years. Peter Pugh Williams was born in Rhyl, Flintshire, North Wales in 1897. The 1901 Census shows that the family lived at 14 Morfa Bach, Rhyl, Flintshire. The head of the family was Catherine Pugh aged 66, a widow. Her daughter Sarah Williams (nee Pugh) aged 31 and Sarah’s two children – Albert Williams aged 6 and Peter Pugh Williams aged 4 years. Nothing is known of Peter’s early life, but it is known that he enlisted at the Recruitment Centre, Rhyl with the Welsh Regiment as Private No. 2584, later transferring to 11th Battalion, Essex Regiment. 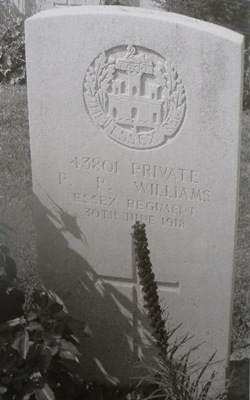 Headstone of Private 43801 Peter Pugh Williams at Nine Elms British Cemetery, Belgium.